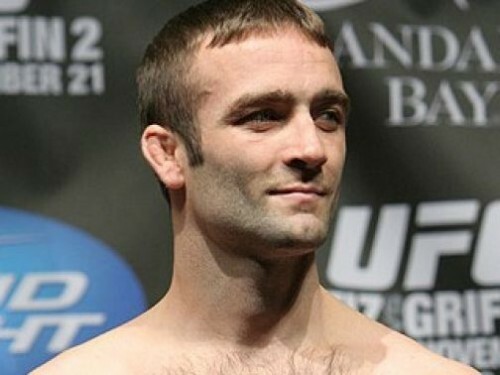 Jacob Volkmann (pictured) would like to give T.J. Grant a belated Christmas present at UFC 141. A lightweight matchup between 27-year-old Canadian T.J. Grant and 31-year-old Minnesota wrestler Jacob “Christmas” Volkmann has been added to UFC 141 taking place Dec. 30 at the MGM Grand Garden Arena in Las Vegas. UFC confirmed Monday via their website that both fighters had verbally agreed to the bout. Since signing with the UFC in 2009, Grant’s (17-5) career has literally been up and down, win one-lose one. With a record of 4-3 inside the Octagon he is coming off a controversial verbal submission victory over Shane Roller at UFC on Versus 6 on Oct. 1. Referee Fernando Yamasaki (Mario’s brother) stopped the bout at 2:12 of round three after Roller cried out in pain during an armbar attempt; he never tapped. Volkmann (13-2) also made his UFC debut in 2009, but after dropping his first two bouts, has won his last four fights in a row. Volkmann is coming off a unanimous decision win over Danny Castillo at UFC on Versus 5 back in August. UFC 141 will feature the return of former UFC heavyweight champion Brock Lesnar taking on former Strikeforce heavyweight champ and the K-1 2010 World Grand Prix Champ Alistair Overeem in the main event. See our Upcoming Events page for the full UFC 141 line-up as it stands.